John Coltrane was born in North Carolina in 1926. His father was a tailor and amateur musician able to play several instruments. Coltrane also showed an aptitude for music, studying the E-flat tenor (alto) horn, clarinet and alto saxophone in high school. Both of his grandparents had been Methodist ministers, and his maternal grandfather had been a famous gospel preacher throughout that part of the Deep South. Churchgoing was part of his upbringing and gospel music provided the soundtrack. When he was thirteen, both his father and grandfather died within a month of each other and after Coltrane graduated from high school in 1943, the family moved north to Philadelphia to make a new start. There he studied at the Ornstein School of Music and Granoff Studios, before making his professional debut in 1945 playing in a lounge band. Following a short term serving in the Navy, Coltrane returned home and having played in the Navy band while stationed in Hawaii (1945–1946), he expressed an earnest interest in the alto saxophone. He worked with a series of bands over the following decade including Eddie Vinson (1947–1948), and he played alto and tenor with Dizzy Gillespie (1949–1951) and Earl Bostic (1952–1953). His first proper recording session was with drummer Teddy Stewart’s Orchestra – made up mostly of Dizzy’s band members – backing Dinah Washington on some singles for Mercury. From 1953, Coltrane focused on tenor saxophone, playing with Johnny Hodges from 1953 to 1954; during this time he appeared on several of Hodges’ Norgran albums. In 1955, Coltrane secured the gig that brought him to a wider audience, playing in Miles Davis’ new quintet, with Red Garland, Paul Chambers and Philly Joe Jones. Coltrane cited 1957 as the year of his spiritual awakening, when he rid himself of heroin and alcohol addictions, catalyzed by being sacked from Miles Davis’ Quintet. Coltrane had previously been fired by Gillespie for his escalating drug taking, and this time losing such a great gig and experiencing a near overdose was the wake-up call that he needed. He went cold turkey and cleaned up. After some tough times straightening himself out, he soon returned to play the second half of 1957 with Thelonious Monk’s Quartet, before once again joining Davis at the beginning of 1958. Ever humble and highly self-critical, Coltrane was perennially searching for a truth in music, an ultimate statement. Between sets, he could be known to walk ten blocks and stare at the night sky through binoculars, in a constant search for inspiration and universal truth. His musical search mechanism worked by rehashing and rephrasing each musical concept in every one of its permutations. This approach initially led to his ‘sheets of sound’, a term coined by jazz critic Ira Gitler in 1958 for Coltrane’s album Soultrane, to describe his innovative improvisational style of repeating rapid-fire arpeggios with minuscule variations. While the evolution of his music was appreciated by many critics and fellow musicians, it was not readily accepted by the public; it all sounded too alien. From 21 March through 10 April 1960, the Wynton Kelly, Paul Chambers and Jimmy Cobb lineup of the Miles Davis Quintet toured Europe, along with the Oscar Peterson and Stan Getz’s groups on a Jazz At The Philharmonic tour. At the Olympia Theatre, Paris, Coltrane’s solo spots were booed and the audience heckled. When Coltrane returned to Paris in 1962, playing even more adventurously, it was to only cheers. While with Davis, Coltrane had been beginning to lead his own recording sessions, giving him increasing opportunity to air his own compositions; “Blue Train” established him as a brilliant composer as well as player. His earliest recordings were for the Prestige label; among the highlights was The Cats from 1957, the same year as he cut Blue Train for Blue Note Records. His debut for Creed Taylor’s Impulse! label came in 1961 when he made Africa/Brass; shortly afterwards he recorded the beautiful Ballads. Two years later, he did John Coltrane And Johnny Hartman, the singer being the perfect foil for Trane’s tenor saxophone. Then in December 1964 he recorded a piece of music composed in the comparative peace and calm to be found in Dix Hills, Long Island, about thirty miles from Manhattan. A Love Supreme was the sermon that Coltrane had pledged to his God if he made it through cold turkey. It was literal expression of worship; a devotional poem that he had written and had reproduced in the gatefold sleeve of the album is expressed syllable by syllable on the saxophone as a “musical narration” in the final track “Part 4: ‘Psalm’”. The group for the session was what became known as the ‘Classic Quartet’ with McCoy Tyner, Elvin Jones and Jimmy Garrison, all of whom had been with Coltrane in various lineups since the early 1960s. Anyone working with Coltrane soon learnt that they would need to be dedicated and have considerable stamina to keep up. Because Coltrane was terrified of flying, the group would always travel by road, spending six weeks on a coast-to-coast tour, then immediately beginning a six-week residency in New York, often at the Half-Note at 289 Hudson Street. Purified of drugs, Coltrane did still have one vice – overeating – food became a comfort for him to assuage the rigours of constantly performing. Legend also has it that Coltrane ate so many mint humbugs that his saxophone keys clogged up with sugar. However, Coltrane wasn’t entirely finished with mind-altering substances. The extremism in his music, the alien discordancy and the look to the East for spiritual meaning was part fuelled by his increasing use of LSD. His experimentation with music started taking on many extra layers, so much so that the loyalty of his trusty colleagues was being tested. The beginning of the end for Tyner and Jones was the Ascension session (1965) where they complained that all they could hear was noise. At the start of 1966, Alice Coltrane – a pianist who Coltrane married in the same year, having recently divorced his first wife – and Rashied Ali replaced the departing duo, performing and recording in various combinations until Coltrane's death from cancer of the liver in July 1967. When asked how he would like to be remembered, he replied, ‘As a saint’. Among the most acclaimed and influential artists in jazz, John Coltrane was also one of the most stylistically diverse, moving from traditional sounds to the furthest edges of the avant-garde in a career that was tragically cut short when he succumbed to cancer at the age of 40. 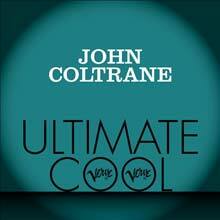 This volume in the Verve Ultimate Cool series devoted to Coltrane's work might raise the eyebrows of fans who will note that Coltrane never recorded for Verve Records; instead, this is primarily drawn from Coltrane's recordings for the Impulse! label, and leans to his more accessible works, ignoring more challenging albums like Meditations and Selflessness, and curiously includes nothing from 1965's A Love Supreme, widely regarded as the saxophone giant's greatest work. But even at his most mainstream, Coltrane's playing was invariably imaginative, intelligent, and emotionally resonant, and that's certainly the case with these 12 selections, which find him drawing slow, beautiful lines out of standards like "Lush Life" and "What's New," or exploring his musical space on "Alabama" and "Theme for Ernie." Given its fairly rigid musical outlook and the fact it's limited to Coltrane's music of the '60s, Verve Ultimate Cool: John Coltrane isn't much as an introduction to his body of work or an overview of a wide-ranging career as a creative trailblazer. But if nothing else, this set shows just how pleasurable Coltrane's music can be, and 52 minutes with one of the true giants of American music in the 20th century is certainly time well spent. Throughout John Coltrane's discography there are a handful of decisive and controversial albums that split his listening camp into factions. Generally, these occur in his later-period works such as Om and Ascension, which push into some pretty heady blowing. 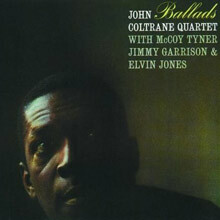 As a contrast, Ballads is often criticized as too easy and as too much of a compromise between Coltrane and Impulse! (the two had just entered into the first year of label representation). Seen as an answer to critics who found his work complicated with too many notes and too thin a concept, Ballads has even been accused of being a record that Coltrane didn't want to make. These conspiracy theories (and there are more) really just get in the way of enjoying a perfectly fine album of Coltrane doing what he always did -- exploring new avenues and modes in an inexhaustible search for personal and artistic enlightenment. With Ballads he looks into the warmer side of things, a path he would take with both Johnny Hartman (on John Coltrane & Johnny Hartman) and with Duke Ellington (on Duke Ellington and John Coltrane). Here he lays out for McCoy Tyner mostly, and the results positively shimmer at times. He's not aggressive, and he's not outwardly. Instead he's introspective and at times even predictable, but that is precisely Ballads' draw. Larry Appelbaum, the recording lab supervisor at the Library of Congress, came across this tape by accident while transferring the library's tape archive to digital. What a find. Forget the Five Spot recording that sounds like it was recorded inside of a tunnel from the far end. The sound here is wonderfully present and contemporary. More importantly, this band -- which also included drummer Shadow Wilson and bassist Ahmed Abdul-Malik -- had it right on November 29, 1957, at Carnegie Hall. The John Coltrane on this date is far more assured than he had been four months earlier on the Five Spot date and on the initial Prestige side Thelonious Monk with John Coltrane. He'd been with Monk for four months and had absorbed his complex, multivalent musical system completely. It's clear from the opening track, "Monk's Mood," where the pair play in duet, that Coltrane is confident and moving into his own. Monk feels that confidence with his nearly Baroque entrance on the tune. This is a hard-swinging band with two front-line players who know how to get the best from one another. Coltrane knows the music inside out and his solos reflect an early version of his sheets of sound methodology. Check the joyous "Crepuscule with Nellie" for the hard evidence. 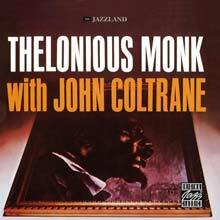 Coltrane's cue and Monk's arpeggios are wondrous, swinging, and full of fire and joy. 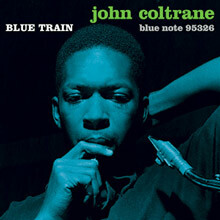 Trane's fills on the melody that leads into his solo are simply revelatory, and the solo itself is brilliant. Or check Wilson's cymbal work on "Nutty" before the band kicks it in full force. Even on the knottiest of Monk's tunes, "Epistrophy," Trane shines and takes charge of his instrument while being utterly receptive to the continual shape-shifting Monk put into his compositions in a live setting. There are nine tunes here (an incomplete version of "Epistrophy" finishes the set) taken from early and late performances. These 51 minutes of music leave the Live at the Five Spot date in the dust. This is one of those "historic" recordings that becomes an instant classic and is one of the truly great finds in jazz lore. It documents a fine band with its members at the peak of their powers together. The package also contains voluminous liner notes by the likes of Ira Gitler, Amiri Baraka, Ashley Khan, Stanley Crouch, and others. This is a must-have. Easily one of the most important records ever made, John Coltrane's A Love Supreme was his pinnacle studio outing that at once compiled all of his innovations from his past, spoke of his current deep spirituality, and also gave a glimpse into the next two and a half years (sadly, those would be his last). Recorded at the end of 1964, Trane's classic quartet of Elvin Jones, McCoy Tyner, and Jimmy Garrison stepped into the studio and created one of the most thought-provoking, concise, and technically pleasing albums of their bountiful relationship (not to mention his best-selling to date). From the undulatory (and classic) bassline at the intro to the last breathy notes, Trane is at the peak of his logical yet emotionally varied soloing while the rest of the group is remarkably in tune with Coltrane's spiritual vibe. Composed of four parts, each has a thematic progression leading to an understanding of spirituality through meditation. From the beginning, "Acknowledgement" is the awakening of sorts that trails off to the famous chanting of the theme at the end, which yields to the second act, "Resolution," an amazingly beautiful piece about the fury of dedication to a new path of understanding. "Persuance" is a search for that understanding, and "Psalm" is the enlightenment. 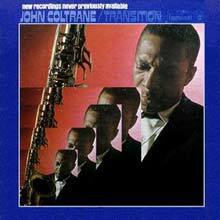 Although he is at times aggressive and atonal, this isn't Trane at his most adventurous (pretty much everything recorded from here on out progressively becomes much more free, and live recordings from this period are extremely spirited), but it certainly is his best attempt at the realization of concept -- as the spiritual journey is made amazingly clear. A Love Supreme clocks in at just over 30 minutes, but if it had been any longer it could have turned into a laborious listen. As it stands, just enough is conveyed. 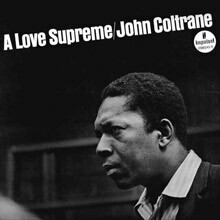 It is almost impossible to imagine a world without A Love Supreme having been made, and it is equally impossible to imagine any jazz collection without it. Although never formally signed, an oral agreement between John Coltrane and Blue Note Records founder Alfred Lion was indeed honored on Blue Train -- Coltrane's only collection of sides as a principal artist for the venerable label. The disc is packed solid with sonic evidence of Coltrane's innate leadership abilities. He not only addresses the tunes at hand, but also simultaneously reinvents himself as a multifaceted interpreter of both hard bop as well as sensitive balladry -- touching upon all forms in between. The personnel on Blue Train is arguably as impressive as what they're playing. Joining Coltrane (tenor sax) are Lee Morgan (trumpet), Curtis Fuller (trombone), Kenny Drew (piano), Paul Chambers (bass), and Philly Joe Jones (drums). The triple horn arrangements incorporate an additional sonic density that remains a trademark unique to both this band and album. Of particular note is Fuller's even-toned trombone, which bops throughout the title track as well as the frenetic "Moments Notice." Other solos include Paul Chambers' subtly understated riffs on "Blue Train" as well as the high energy and impact from contributions by Lee Morgan and Kenny Drew during "Locomotion." The track likewise features some brief but vital contributions from Philly Joe Jones -- whose efforts throughout the record stand among his personal best. Of the five sides that comprise the original Blue Train, the Jerome Kern/Johnny Mercer ballad "I'm Old Fashioned" is the only standard; in terms of unadulterated sentiment, this version is arguably untouchable. Fuller's rich tones and Drew's tastefully executed solos cleanly wrap around Jones' steadily languid rhythms. Without reservation, Blue Train can easily be considered in and among the most important and influential entries not only of John Coltrane's career, but of the entire genre of jazz music as well. Universally regarded as one of the greatest collaborations between the two most influential musicians in modern jazz (Miles Davis notwithstanding), the Jazzland sessions from Thelonious Monk and John Coltrane should be recognized on other levels. While the mastery of the principals is beyond reproach, credit should also be given to peerless bassist Wilbur Ware, as mighty an anchor as anyone could want. These 1957 dates also sport a variety in drummerless trio, quartet, septet, or solo piano settings, all emphasizing the compelling and quirky compositions of Monk. A shouted-out, pronounced "Off Minor" and robust, three-minute "Epistrophy" with legendary saxophonists Coleman Hawkins, Gigi Gryce, and the brilliant, underappreciated trumpeter Ray Copeland are hallmark tracks that every jazz fan should revere. 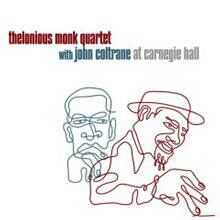 Of the four quartet sessions, the fleet "Trinkle Tinkle" tests Coltrane's mettle, as he's perfectly matched alongside Monk, but conversely unforced during "Nutty" before taking off. Monk's solo piano effort, "Functional," is flavored with blues, stride, and boogie-woogie, while a bonus track, "Monk's Mood," has a Monk-Ware-Coltrane tandem (minus drummer Shadow Wilson) back for an eight-minute excursion primarily with Monk in a long intro, 'Trane in late, and Ware's bass accents booming through the studio. This will always be an essential item standing proudly among unearthed live sessions from Monk and Coltrane, demarcating a pivotal point during the most significant year in all types of music, from a technical and creative standpoint, but especially the jazz of the immediate future. 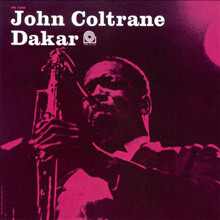 Dakar (1957) presents half-a-dozen numbers recorded April 20, 1957 by an ensemble credited as the "Prestige All-Stars." On the bandstand for this date are John Coltrane (tenor sax), Cecil Payne (baritone sax), Pepper Adams (baritone sax), Mal Waldron (piano), Doug Watkins (bass), and Art Taylor (drums). Although at the time these were considered "leaderless" units, upon hearing the interaction of the participants, modern ears might desire to qualify that statement. The Latin-flavored title track "Dakar" finds Coltrane adapting his solo to faultlessly conform to Payne and Adams' comparatively fuller-bodied involvement. The brooding chord progressions take on dark overtones with Coltrane joining Waldron as they burst forth fuelled by the soulful brass section. "Mary's Blues" is a treat for sax lovers as Adams -- who penned the number -- almost immediately raises the musical stakes for Coltrane. The differences in their respective presentations offer a contrast that complements the cool refinement of Adams and Pepper when juxtaposed with Coltrane's frenetic flurries. Particularly engaging are the sequence of four-bar blasts from the horn players, just prior to Coltrane pushing the combo through their paces. On "Route Four" the strongest elements of each player surface, creating one of the platter's brightest moments. Right out of the box, Waldron unleashes line upon line of masterful lyricism. The driving tempo keeps the instrumentalists on their toes as Coltrane is sandwiched between the undeniably and equally inspired Payne and Adams. Here, the urgency of Coltrane's tenor sax clearly tests the boundaries of the Taylor/Watkins rhythm section. The moody and sublime ballad "Velvet Scene" is a Waldron composition containing some of the author's strongest individual involvement as he interjects his expressive keyboarding directly into the melody. If the album is flawed, that may well be due to Coltrane's inability to deliver during "Witches' Pit." Perhaps because he is the first soloist, there seems to be no immediate direction to his playing. In a highly unusual move, he simply trails off rather than concluding his portion with his usual command and authority. "Cat Walk" restores Coltrane's sinuous leads during a couple of jaunty double-time excursions that tread gingerly around the catchy tune. Jazz enthusiasts -- especially lovers of Thelonious Monk -- should easily be able to discern Adams' nod to "'Round Midnight." 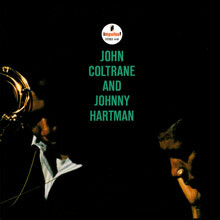 John Coltrane's matchup with singer Johnny Hartman, although quite unexpected, works extremely well. Hartman was in prime form on the six ballads, and his versions of "Lush Life" and "My One and Only Love" have never been topped. Coltrane's playing throughout the session is beautiful, sympathetic, and still exploratory; he sticks exclusively to tenor on the date. At only half an hour, one wishes there were twice as much music, but what is here is classic, essential for all jazz collections. 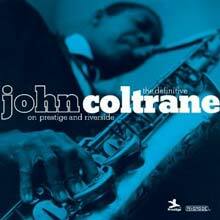 The Definitive John Coltrane on Prestige and Riverside compiles studio tracks recorded between 1955 and 1958 with the tenor saxophonist as sideman and leader. The 21 tracks follow Coltrane's artistic development from his first record with Miles Davis, The New Miles Davis Quintet, to his last sessions as a leader for Prestige, Bahia, in December 1958. Aimed at the casual listener, the majority of these tracks, taken from 18 different albums, are a nice balance of standards including "Come Rain or Come Shine," "I Want to Talk About You" and "Time After Time," with such modern jazz classics as "Oleo," "Round Midnight," and "Lush Life." Coltrane appears with an extraordinary roster of musicians on these dates: Miles Davis, Thelonious Monk, Red Garland, Philly Joe Jones, and Art Taylor. This is an excellent sampler spotlighting Coltrane's development from hard bop master prior to his innovative "sheets of sound" style for Atlantic records and his most challenging Impulse dates of the mid 60s.